1/50.- Welcome to Barcelona !!! Hello! Welcome to Barcelona! One of the most beautiful cities in the world! Barcelona is a very special city for me, because it is the city where I was born and where I live. Follow the arrows, and you'll have the opportunity to discover some of the marvels of this city and learn a lot about the local culture. 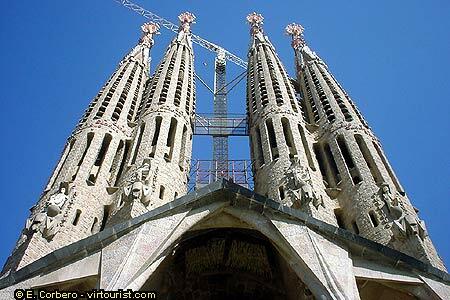 I hope you'll feel virtually in Barcelona while you visit this site. By the way, we are now in front of 'La Sagrada Família' (The Holy Family), Gaudi's Master Piece. Barcelona is the capital of Catalonia, a nation without state between France and Spain. We, Catalans, are very proud of our language (Catalan), our culture and our history.